There's a 2015 version of this. What you see below is an archived copy of the 2014 version. 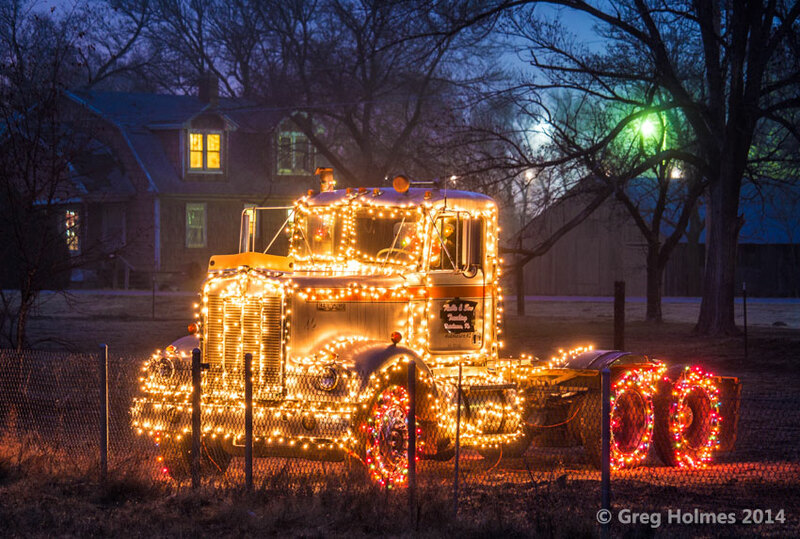 Hutchinson, Kansas, has a lot to offer in Christmas lights and displays. This was a guide of such for 2014, composed primarily of pictures from that year. Some of these pictures were taken prior to this year but I have checked to see that any I used from previous years are pretty much accurate for 2014. I'm in the process of rearranging this post into areas of town so it's more user-friendly. As more people put up lights and as I discover more, I'll be adding to this post so if you have anything to suggest, please comment. This is the only section of town for which I'll offer route suggestions; it lends itself to it. 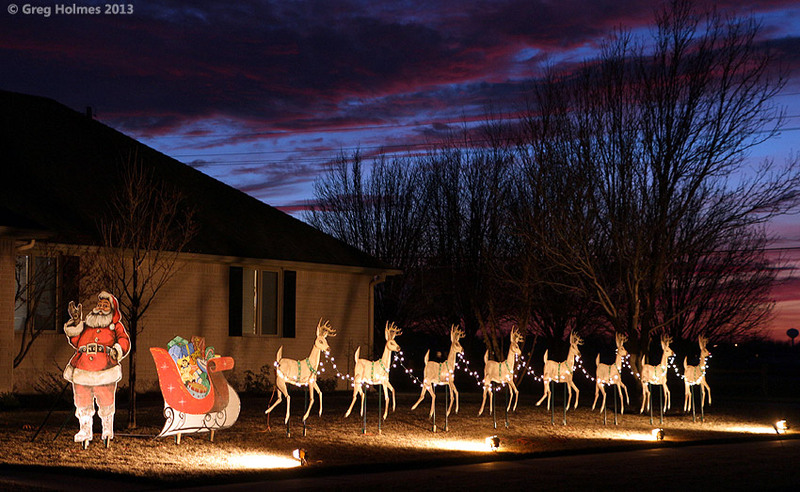 Starting at 30th Avenue where North Main Street ends and Countryside begins, drive the gentle curve north to northwest on Countryside and come to the magnum opus of Hutchinson's Christmas stuff at 25 Countryside Drive. The lawn of "Grandma's House" is densely populated with the automations of Dale Hankins. Each mechanical grandchild is on its way to Hankins' house via a different mode of transportation. Here's a video I shot last year as it snowed on the display. Dale, a retired nuclear scientist, adds new pieces most years to the amusement of his very real kids and grandkids. For background information see our posts from 2007 and 2008, 2009, 2010, 2011 and 2012. 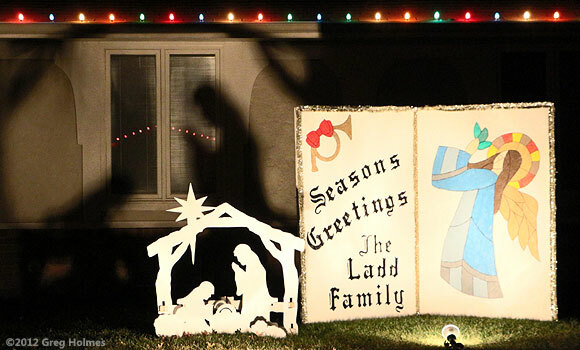 Caddy-cornered from Grandma's House you'll see Dale's daughter's fine display of lights. 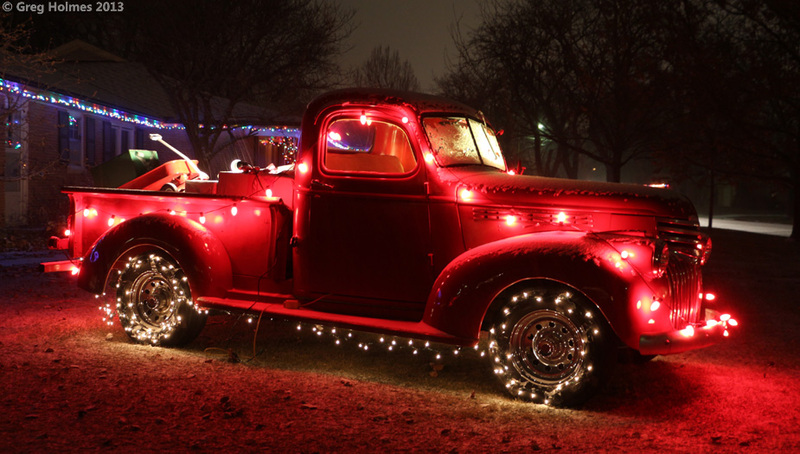 Proceed to the NE corner of Carlton Road and Curtis Drive where you'll find this vintage red truck being driven by Santa. 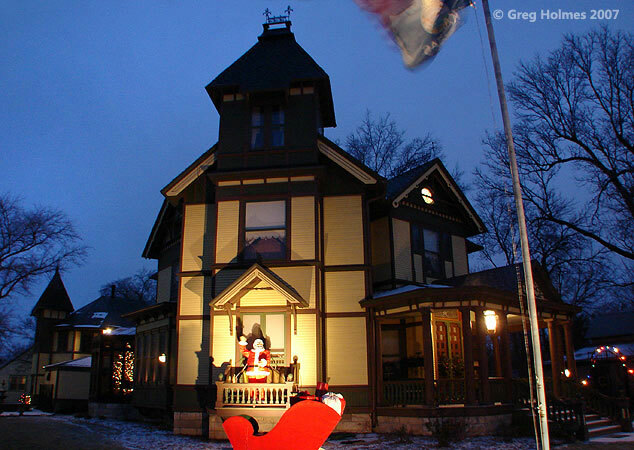 The house on the NW corner of Adams Street and 30th Avenue used to feature Christmas attire on its metal lawn bison. 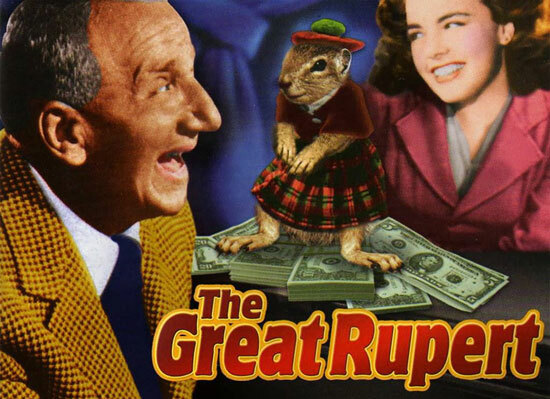 So far in 2014 this is not the case. 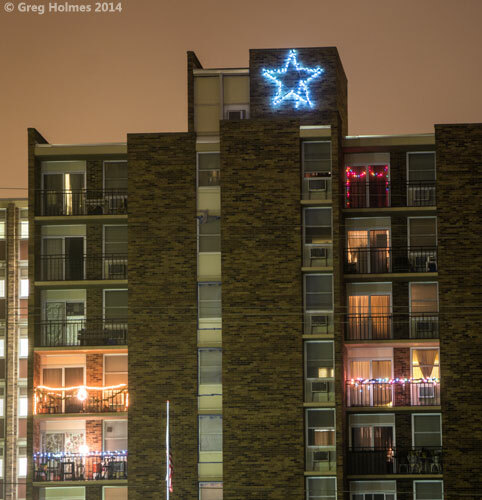 As you pass Monterey Place on the west side of Monroe, you'll see that the Wesley Towers retirement complex down the street at 700 Monterey Place features stars facing four directions, horizontal architectural lights and a pole tree. This is also a small theme neighborhood at some homes in the vicinity have smaller pole trees. Now go north on Monroe. 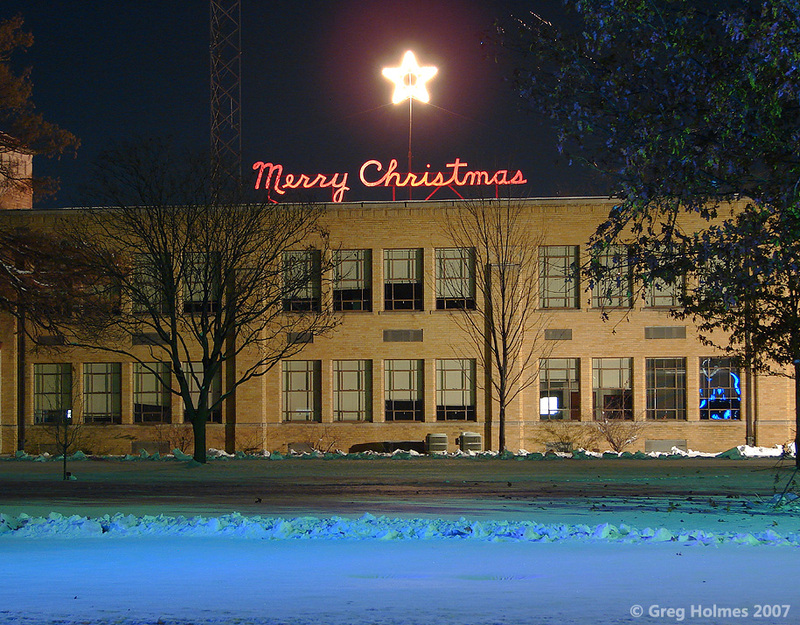 First Church of the Nazarene, 4290 N Monroe, has a set of four singing Christmas trees with music at 90.7 FM as seen in this video from 2012. As of December 23, 2014, it was operating. This year the building is surrounded with green pole trees as well. After getting your fill of this, head north on Monroe. 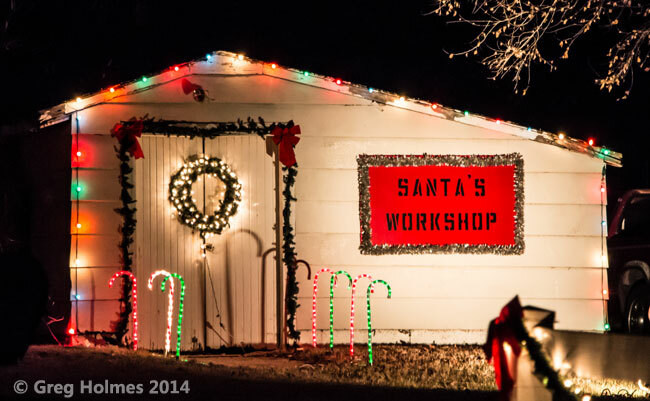 The northernmost attraction I am listing is Santa's Workshop at 6420 North Monroe, where a U-shaped driveway furnishes some lights and this humble workshop. Here's a video and another view. After seeing this, you might turn around and go back south on Monroe and turn east at 43rd, then take a slight detour south down Plum to 41st. A neighborhood composed of a small network of streets north of 43th, beginning with Pagoda and ending with Sequoia, features large wooden Christmas cards, though sadly the tradition is fading and I've seen only three so far in 2014. 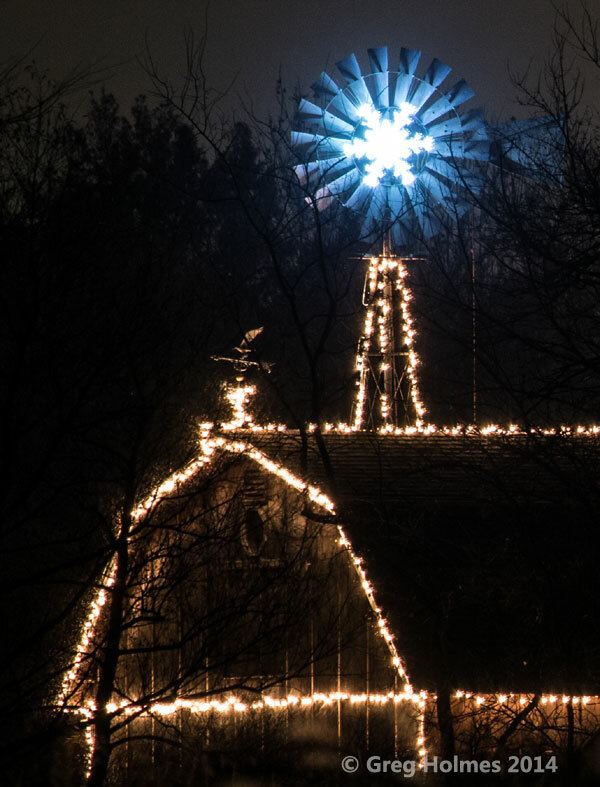 To the south of 43rd, visible behind a house and through some trees, you'll see an outlined barn and windmill with a snowflake on the vanes. It's pretty cool but somewhat hard to see. The address is 1703 East 43rd and the farm is between Lorraine and Panorama. Here's another view. Proceed on west to Halstead and turn south...unless you see something cool that I didn't note here, then by all means ignore me and go for it. As a matter of fact you might want to detour a block east on 42nd to see that house with all the green lights in the tree before you go back to Halstead and continue south. Proceed south to 30th Avenue and turn east. You'll go quite a way, crossing K61 and heading toward the neighborhood known as the Spyglass addition, where well-off folks live near the Prairie Dunes country club. 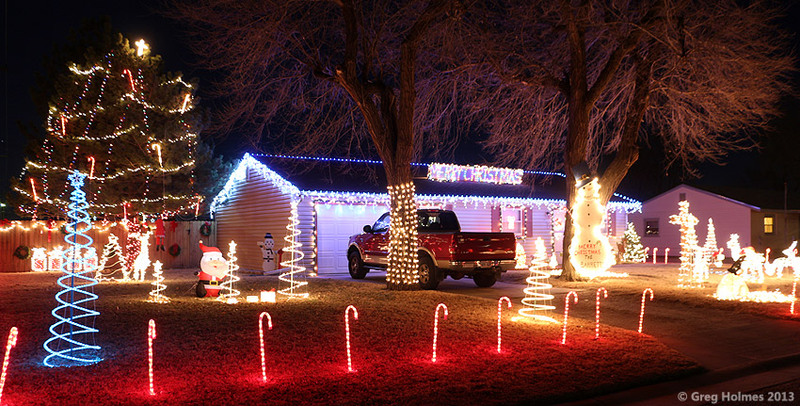 Most decorate their house with tasteful but restrained white lights, but every once in a while someone goes the extra mile so once you're in the neighborhood you might want to set your radio to 103.3 FM. And so we have a light and music synchronized display in an otherwise quiet neighborhood on the south side of Prairie Hills Drive. I couldn't see the address but you can't miss the huge "MERRY CHRISTMAS" and pole trees flashing to music broadcast at 103 FM. When you're done with that proceed back to 30th and turn west to Hutchinson. This concludes the loosely guided tour of the area north of 30th Avenue, The displays in Hutchinson are pretty evenly distributed and don't lend themselves to a tour. 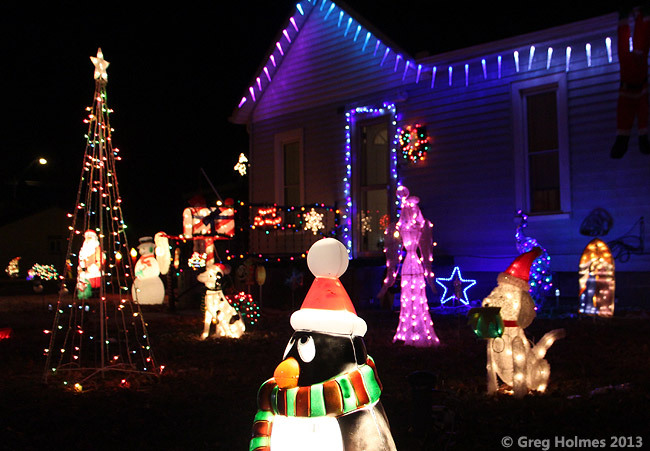 Aside from its impressive luminaria (past for this year), the Hyde Park area has some wonderfully decorated homes. 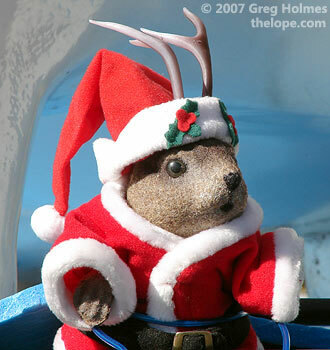 This resident at 201 West 20th Ave. displays a collection of blow mold Santas. The house at 62 Meadowlark Lane is a sort of cornerstone of this neighborhood and is often the most decorated. It looked particularly good last year after this snow. 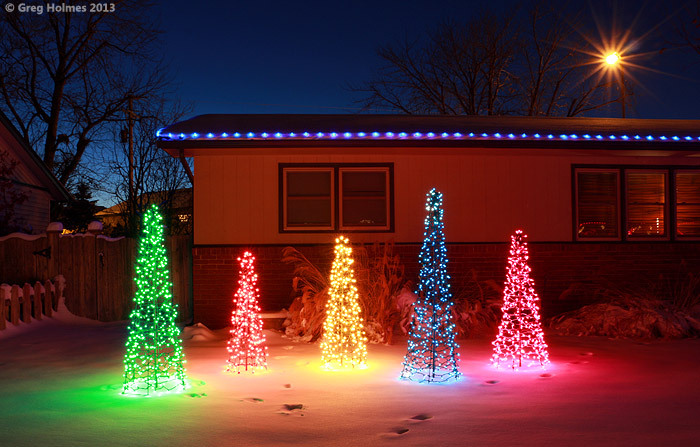 This one on Meadowlark Lane near 23rd Avenue displays the same pole trees in 2014 that I shot in this 2013 snow. 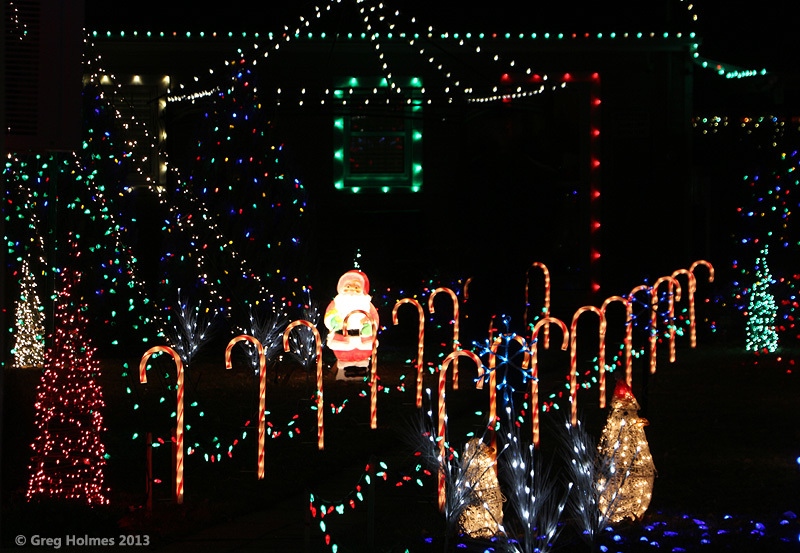 Within this area, part of East 20th Avenue displays blow mold candy canes though there are fewer this year. Blow mold candy canes, like most other blow molds are not easy to obtain anymore. 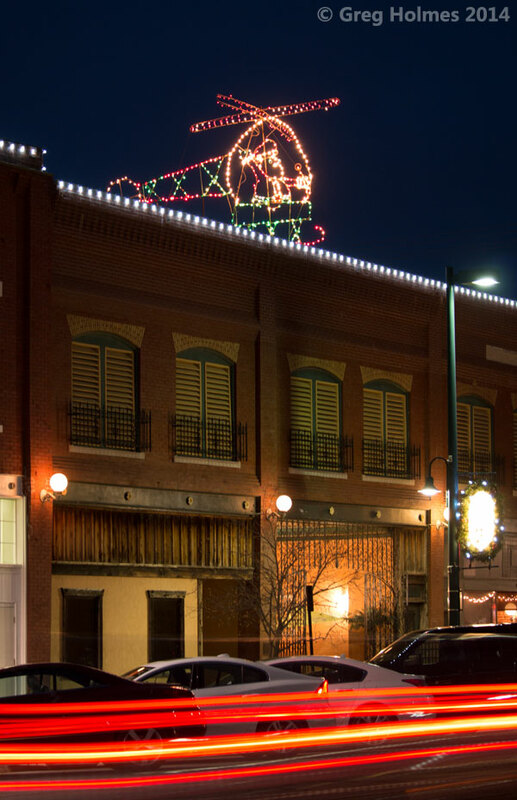 The most prominent Yuletide feature of the Antique District of South Main Street is this this light frame helicopter atop the Anchor Inn at Main Street and Avenue B. Here's a wider view. Returning for 2014 after being absent last year is this animated light frame train atop Anchor Away between Avenue A and Avenue B on South Adams. 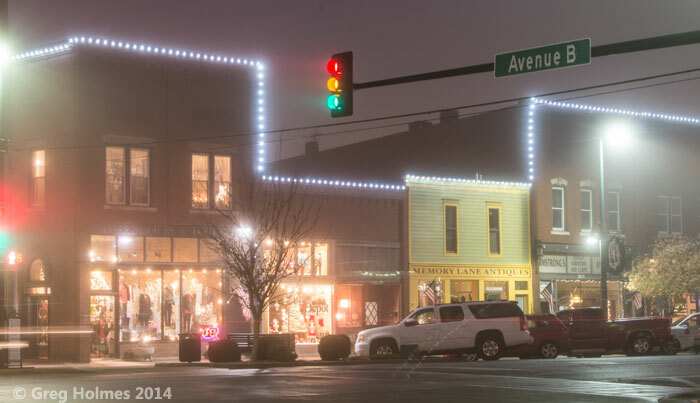 In 2014, new LED lights were added to downtown from about Avenue C to 3rd Street. 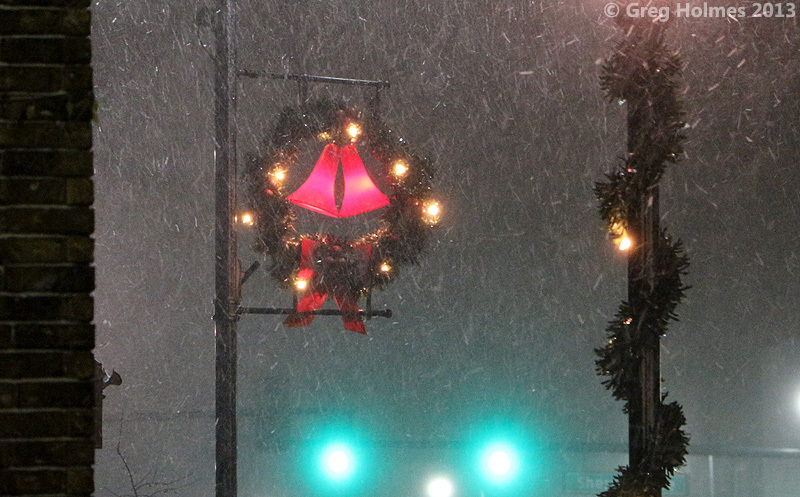 I couldn't resist shooting when convenient snowstorm occurred. All colors of the stoplight are seen since this is a time exposure. 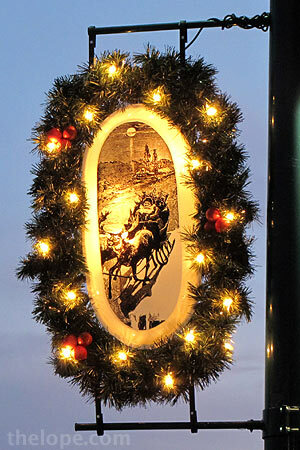 This style of wreath with bells is used along Main and a little bit of some side streets from Avenue A to the BNSF railroad tracks at about 3rd Avenue. In 2013 the incandescent lights in the wreaths seen above were replaced with cool white LED lights. 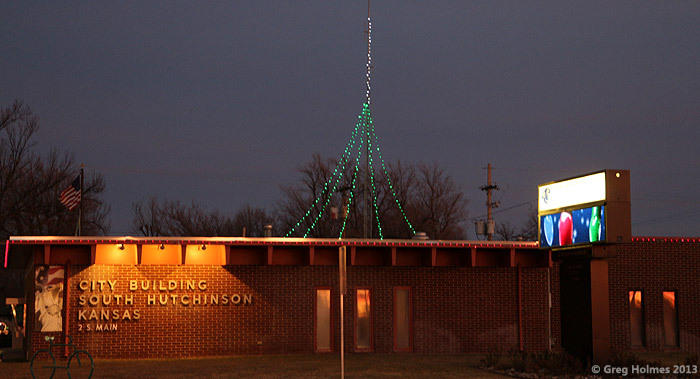 For more pictures of Hutchinson's street pole decorations under lots of weather conditions, see my 2010 Hutchinson Christmas light guide. 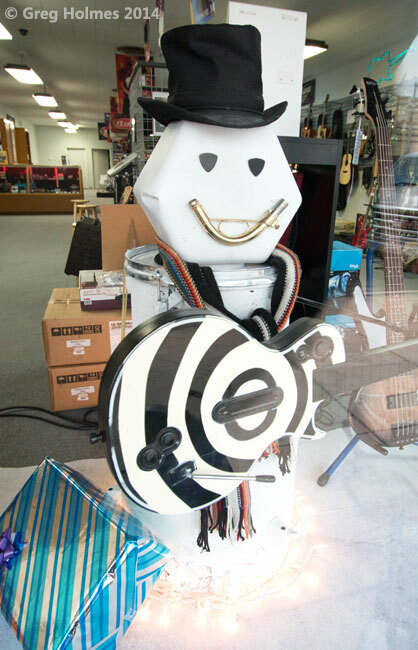 The window of Johnson Music at 5th and Main features a snowman made of drums. Here's a night view. 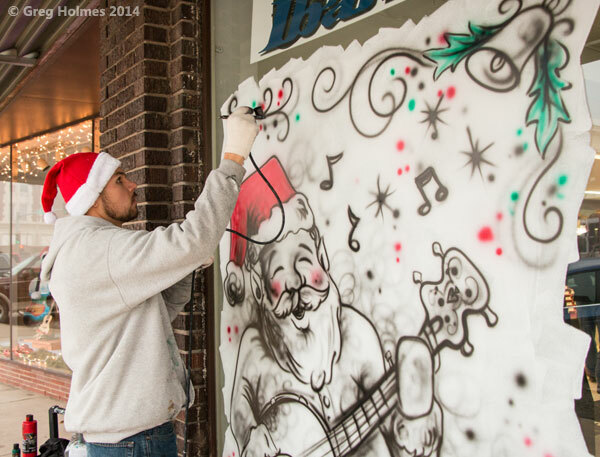 Something entirely new in 2014: artist Brady Scott painted many of Main Street's business windows this year from about 3rd through 7th streets. 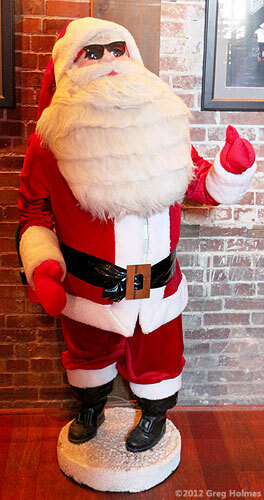 Jillian's Italian Grill at 216 N Main Street displays a motorized store display Santa inside. For the last few years they have felt he needs sunglasses. 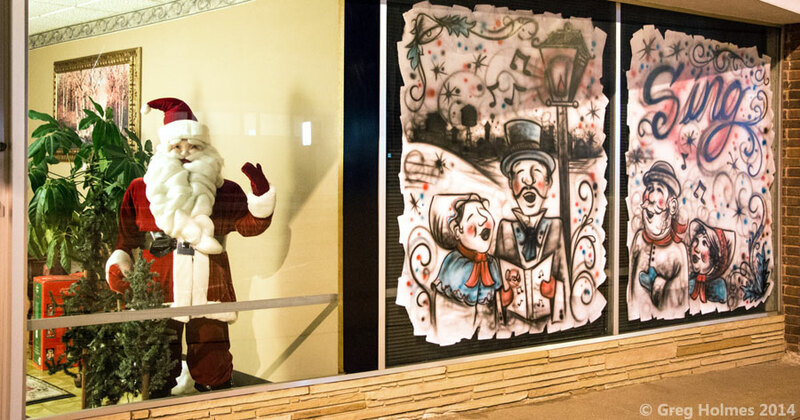 Reger Rental at 615 North Main Street displays a motorized store window Santa. 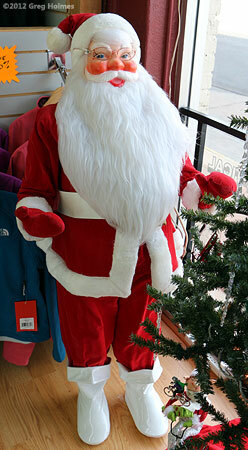 The Kumorowski & Kumorowski attorney office at at 523 North Main displays an older Santa in the window. 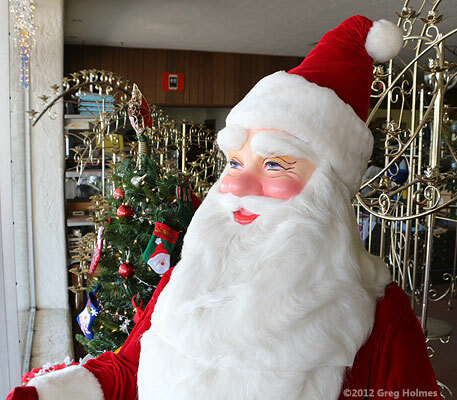 The Cabinet Store next door at 521 North Main has a smaller vintage Santa. 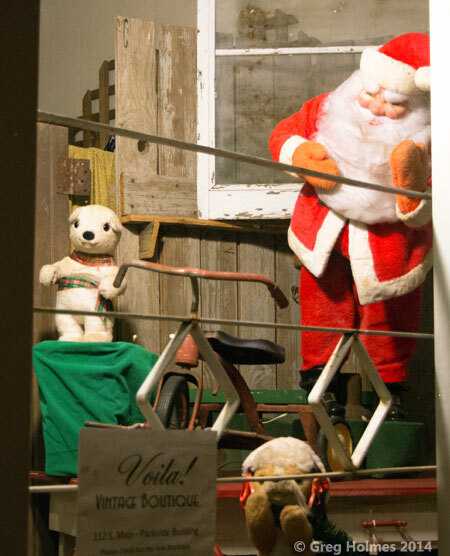 Harley's Bicycles at 629 North Main has displayed a vintage Santa inside for the past several years. 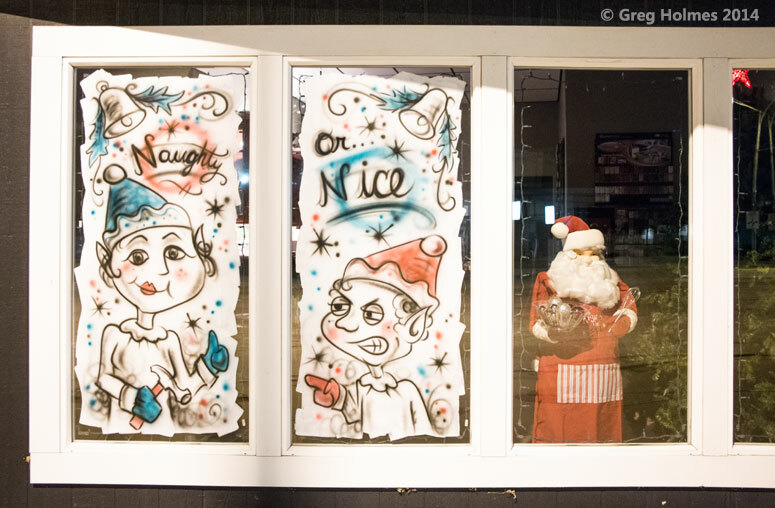 Necessities at 622 South Main has displayed a vintage Santa, reindeer, seal and puppy in their window for the past several years. 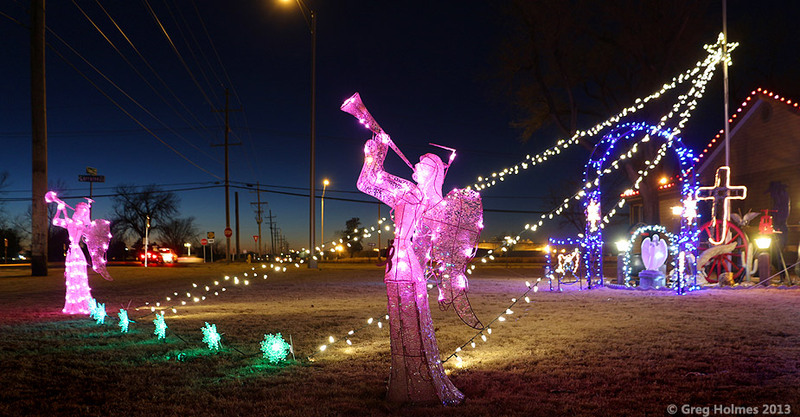 There are at least two synchronized music and light shows in Hutchinson. I have listed the FM radio frequency you'll need so you can already be tuned in as you approach. 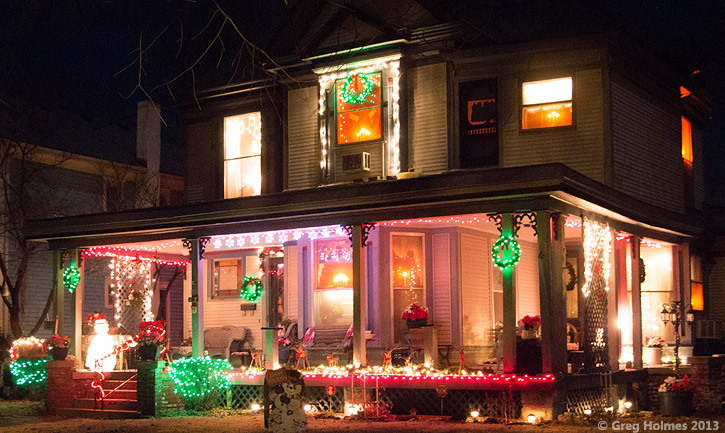 2014 marks the second year of the Carson family display at 810 East 2nd Ave. Set your radio to 106.7 FM. 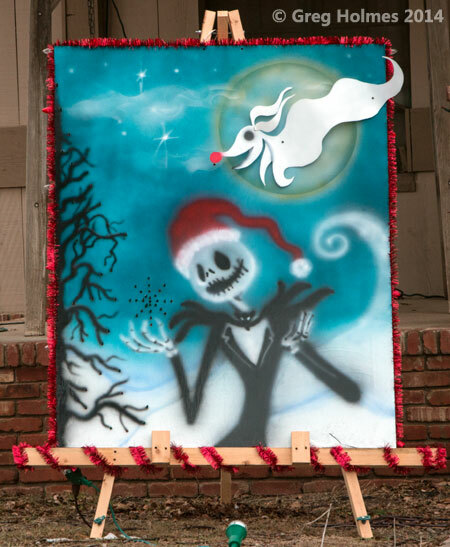 18 West Avenue G displays artwork of the time the Pumpkin King thought to take over Christmas. 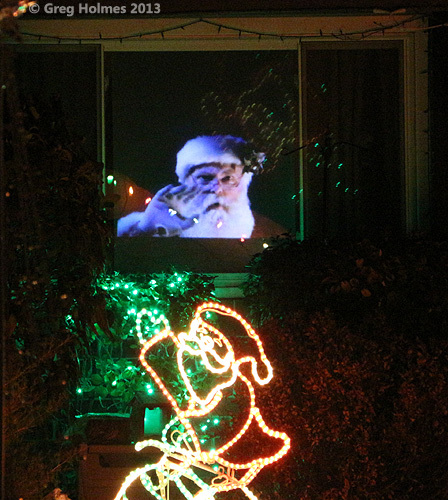 "David's Display" at 804 Newport Road features a flat screen TV placed against a window with a DVD of Santa within the room and occasionally looking out. This 1975 Kenworth truck on the south side of K61/US50 just west of the Ken Kennedy Freeway exit and where 61/50 crosses the Arkansas River. The Keasts and the Cranes wish you a Merry Christmas with this fire truck on the south side of 3rd Ave. just east of Severance. Apparently stuffed bears can get drivers licenses in Hutch as this is being driven by one. 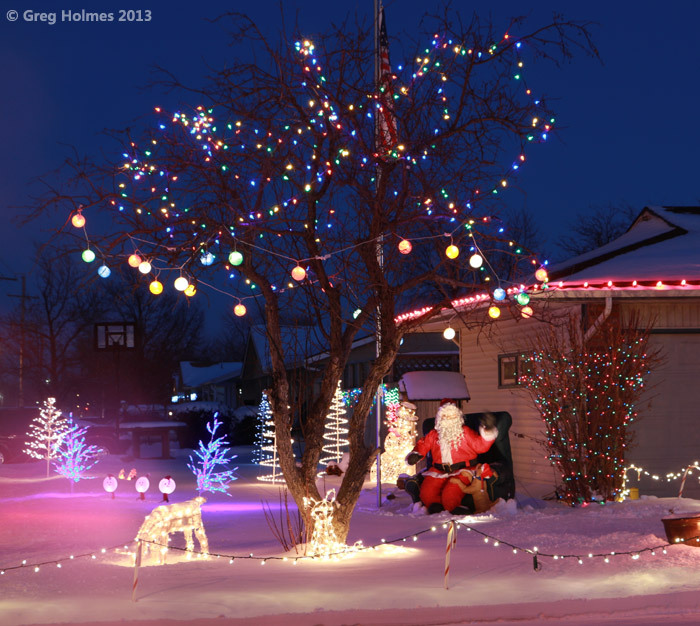 The Johnsons at 400 East 12th Avenue have added new decorations every year for decades. 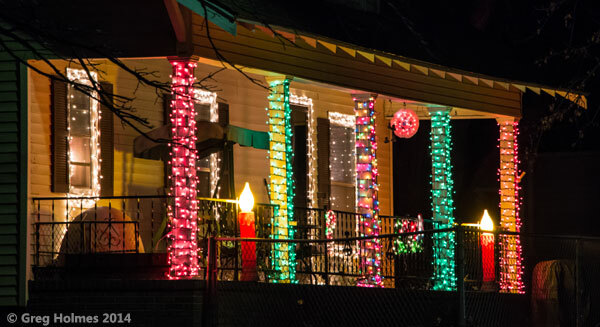 The Houston Whiteside Historical District has a number of decorated homes. 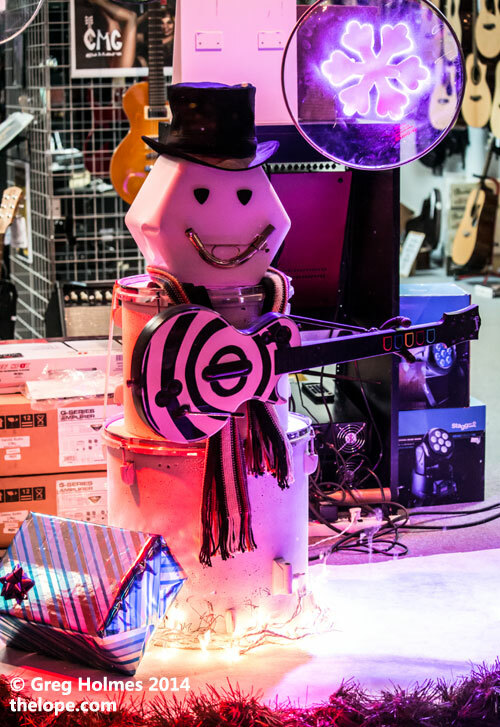 This one, at Plum Street and First Avenue, features a talking, singing automated Santa (a weather resistant version of a Gemmy Industries Santa). The district is roughly bordered by the BNSF railroad tracks on the North, Avenue B on the South, Elm Street to the West and Pershing Street to the East. 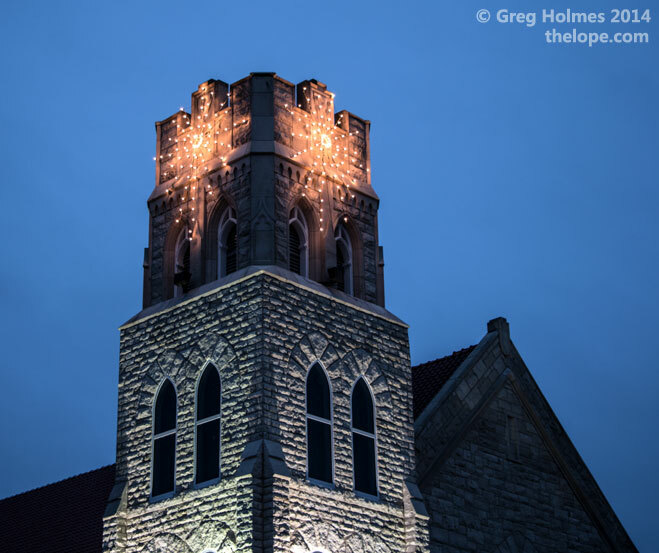 The First Presbyterian Church at 201 East Sherman has star patterns made of lights atop its tower. Here's a wider view. 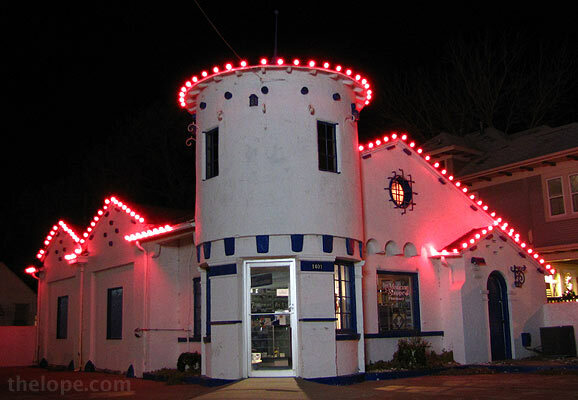 The Medicine Shop at 1401 North Main Street, a wonderful bit of local architecture, is outlined with red lights again this year. 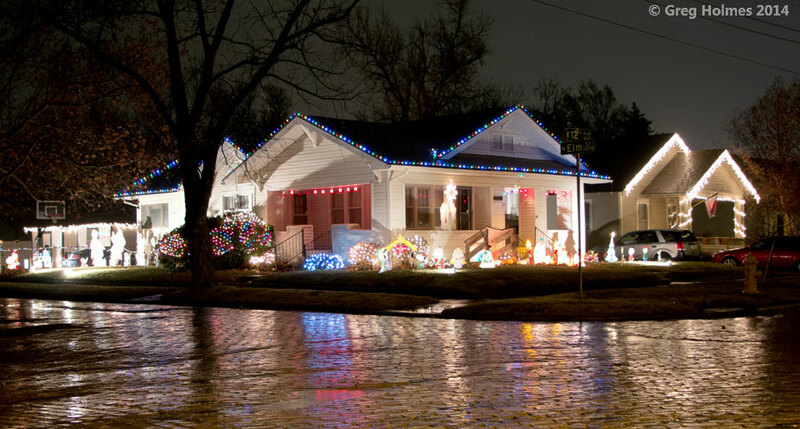 The Barretts at 204 South Walnut in South Hutchinson have illuminated their home in a fashion that draws attention from hwy 96. There is also a speaker on the lawn playing Christmas music from a local radio station. 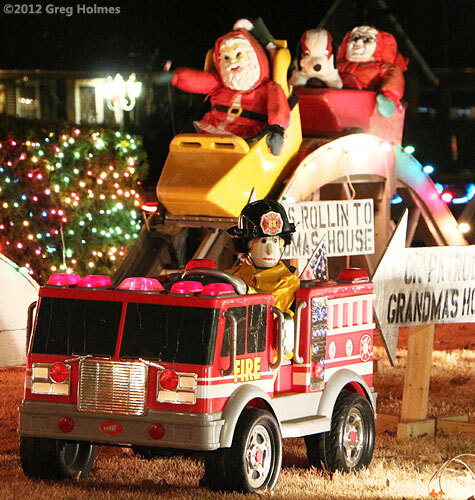 A sign in the yard this year indicates that Santa has fit them into his 2014 schedule and will be there on December 20, 6-8pm and that there will be candy canes for kids. 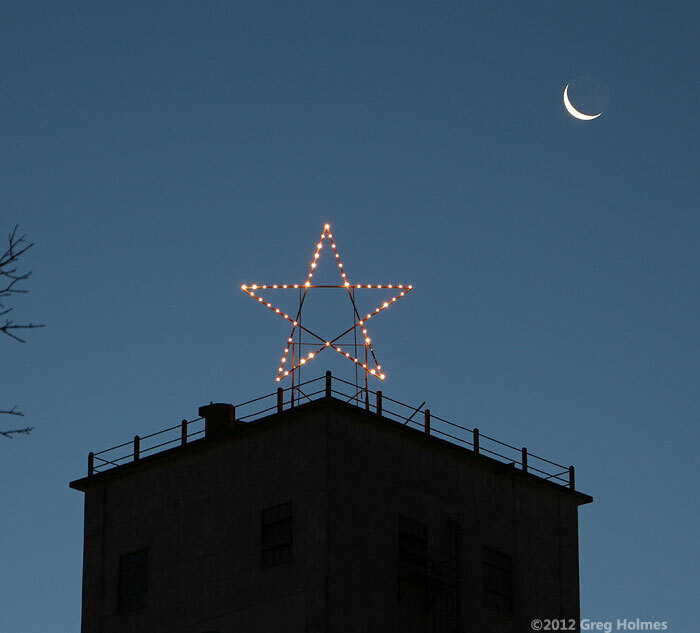 The tall apartment building behind Alco has a star atop. 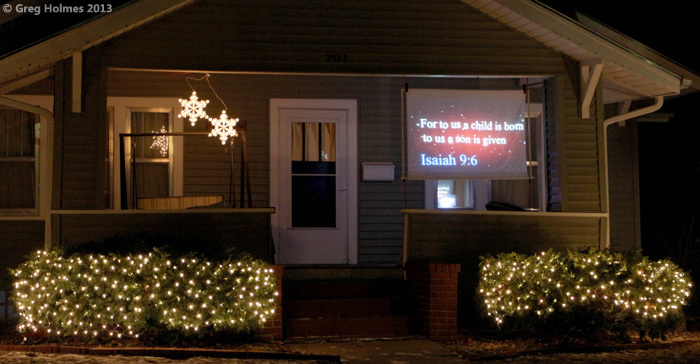 A residence at 455 Justice has the same great display in 2014 as pictured here, last year. Moving north up the same block of Justice is a span of four houses extends to 431 Justice. 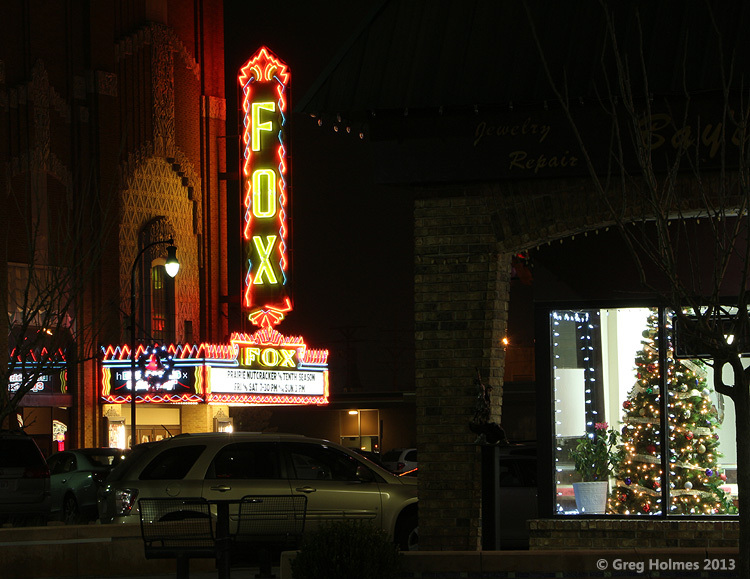 The Fox Theatre will show It's a Wonderful Life on Christmas day at 7:30 p.m. 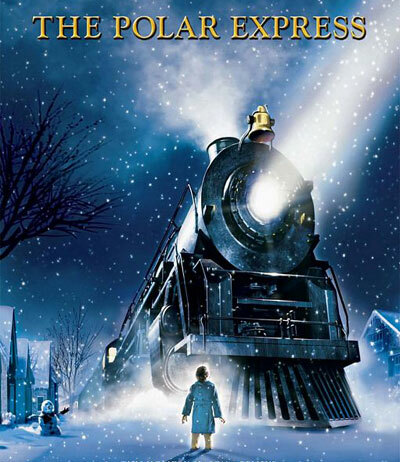 According to its website, the Kansas Cosmosphere will show The Polar Express in its digital dome theatre on December 12-14, December 19-23 and December 26-January 1 at 7 p.m. It's best to call 800 397-0330, extension 312 for confirmation and details. 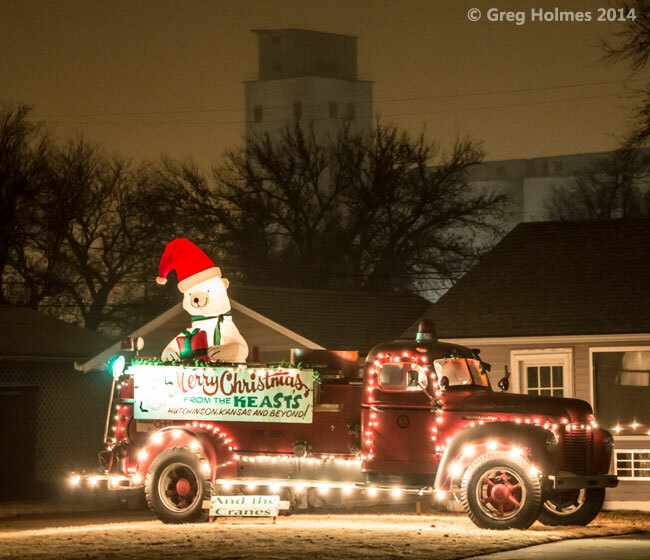 The Hutchinson Christmas parade happened November 22, but you can still see it, 'cause I recorded it. For some past Christmas parade adventures, see these tales of a dinosaur and a muffler man head. In 2007 I looked at signs along the parade route and in 2008 I looked at people. 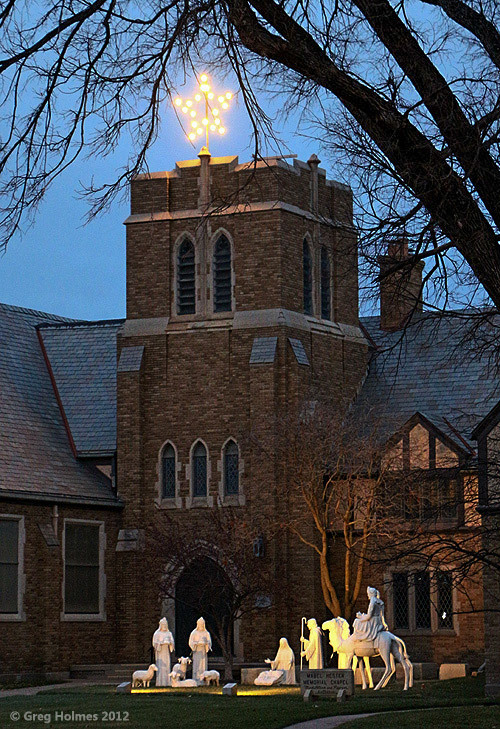 The Hyde Park luminaria was held the night of December 20. The annual event started in 1983 and now spreads over 36 blocks - east to west from Main to Monroe and north to south from 23rd to 18th. If all holds as usual, it will be held on December 19 in 2015. 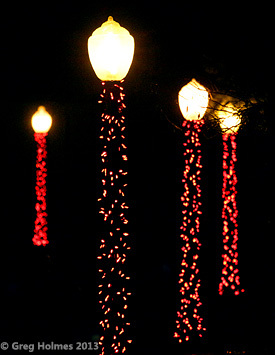 For more info and pictures see Hyde Park Luminaria in Hutchinson and The Hyde Park Luminaria, 2012. Thank you for the trip down memory lane. Still miss "home" very much. 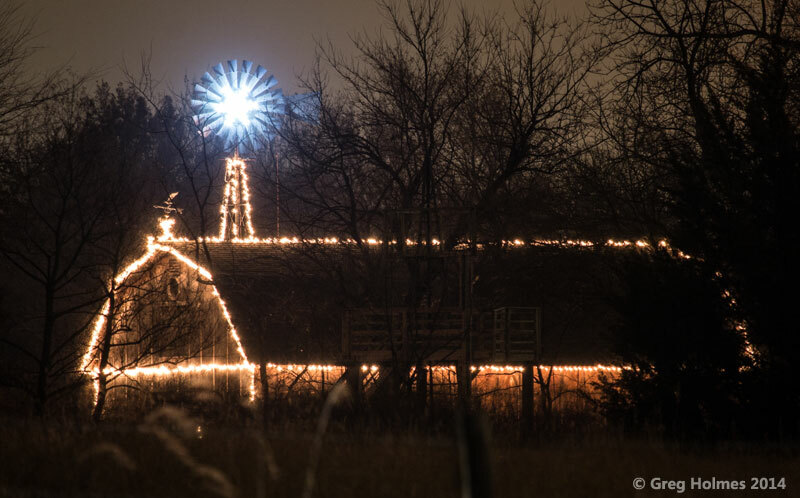 Also check 1703 east 43 with the windmill and barn lit. 6420 N Monroe is another good one. Driveway is circular so you can drive through. Santa's Workshop makes a perfect photo op! 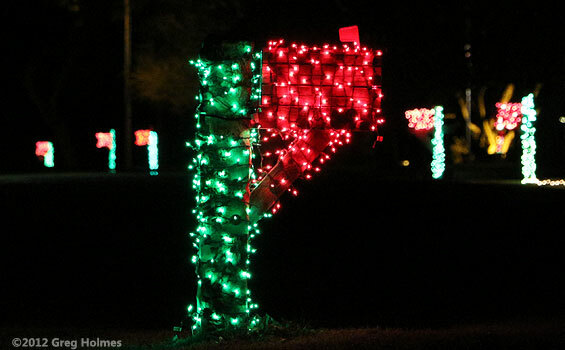 Do you have pictures from the 2013 luminaries? Thanks, anonymous person; I saw that cool windmill and barn on E 43rd but it's back a ways from the road and I didn't see if there was a spot from which to shoot it without obstacles in the way that wasn't on private property. I'll look again this week. And thanks, 2nd anonymous person. I've seen that drive through at 6420 N Monroe in previous years but haven't ventured that way yet this year, I sure will this week, though. 6420 n monroe is very decreative and very going it is a drive in and you can see everything.... VERY AWESOME!! 6420 N monroe are usually on all evenings until around 11 or 12pm. Yes you are welcome to come drive through the driveway.